When Tammy asked if I wanted to go for a walk “to Dairy Queen” around 8:15 p.m., I quickly said NO because I had already showered and was ready to relax and watch a movie. But when I saw how disappointed she looked, I gave in and said we could go but she better hurry. In what I believe was the fastest time she’s ever gotten out of the house (still waiting on the official notification) we left. A block away from the house I continued to go straight when Tammy crushed my spirits. Me: I thought we were going to Dairy Queen. Tammy: No. It’s too late to walk there. Me: Geesh. Thanks for letting me know. I even brought my wallet. Tammy: I was just kidding dummy. I knew it was too late to walk there. So instead of heading toward DQ, we turned down a circle of homes that are occupied by the elderly that is in the shadow of two assisted living places. Sensing my disappointment in not getting a Blizzard, Tammy attempted to cheer me up. Tammy: Hey look… There’s some windows you can peep in. Me: Oh yeah, that’s great. I can watch them die. Oh I think she’s dead already. Tammy: Maybe you’ll see a naked woman. She knows how I always look into windows when we go into Chicago hoping that someday I’ll catch someone doing nekkid jumping jacks in their window. So far no luck, but I’m not giving up. Crazy Cats and What Was That?!? Tammy stopped walking, was staring at the ground and pawing at her right ear but no more words came out. I thought she was demonstrating what was making the cat “crazy” but I was wrong. Tammy: Oh my God. I think a bug just flew in my ear. Me: Oh. I thought you were showing me what the cat did. Tammy: I’m serious. I think a bug flew in my ear. I think it’s still in there too!! Tammy: You don’t know!! 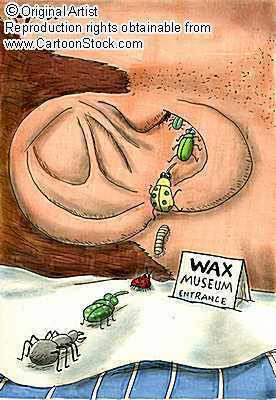 I told you about how a Japanese Beetle crawled into Tim’s (not Tim G) ear. Tammy: Yeah one crawled in his ear and was buzzing so he had to go to the hospital to get it out. That’s gonna happen to me. I tried my best to reassure her that a bug wasn’t in there and starting asking about the crazy cat again. She told me how it would get right in front of her shins and would jump just as it was about to rub against her. That kept her mind off her ear for about 43 seconds. The rest of the walk she kept rubbing her ear and shaking her head. We had started to make the turn back when I heard what sounded like Tammy slapping herself. I turned to see that Tammy had slowed down and was holding her head. Tammy: I just slapped myself in the head. I felt a bug on me and slapped myself. Hard. That slap apparently triggered the thought of a bug in her ear as thoughts started racing through her head. Tammy: I saw “Monsters Inside Me,” I know what they do in there. They lay eggs and then they hatch in my brain. Me: That’s not going to happen. Tammy: It could. It did to that person on that show. As we were getting closer to home Tammy’s bug paranoia got worse. Tammy: I need to start wearing ear plugs or cotton balls when I walk so bugs don’t get in my ear. When we were less than a block away Tammy started running. As she was running away I heard her yell back to me. Tammy: My feet feel like ten pound bricks. By time I got to the house, Tammy was still feeling the effects from the night’s events. Tammy: I can’t tell if it’s from my ear or my face hurts from slapping it. Gallery | This entry was posted in Daily Life and tagged 2011, daily life, funny, humor, running, walking. Bookmark the permalink. 2 Responses to Can You Ear Me Now?